In order to see laser beams and graphics, there MUST be something for the light to reflect off. 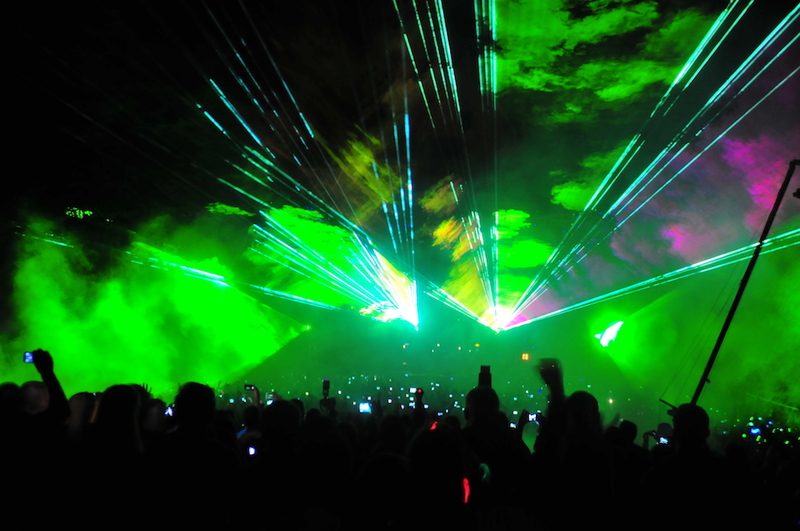 It is not possible to do an effective laser beam show in clear air. And it is not possible for laser graphics to magically appear in mid-air (á la Princess Leia in Star Wars) without there being something for the light to reflect off of. In the case of beams, this means there must be particles in the air. The particles can already be in the air, such as dust, fog, smoke, humidity, rain and snow. Or for more controllability, the particles can be added with haze, fog or smoke machines, water screens, liquid nitrogen “curtains”, fireworks smoke, etc. One problem with putting particles in the air is that if the room is too clouded, it may trigger smoke detectors. The result at best is disruptive fire alarms, and at worst is activation of sprinklers. To prevent these problems, a fire watch is required. Under a fire watch, the fire detection system is disabled for rehearsals and performances. One or more people manually watch for fires, and this must be their only responsibility. Should there be a fire emergency, they can activate alarms and fire suppression equipment. Once the air has cleared, the normal fire detection system can be reactivated. In the case of laser graphics, to see the image there must be a screen such as a wall, movie screen, translucent film, or scrim. A “scrim” is a loosely woven cloth, often black. Part of the beam hits the scrim material, so that in darkness laser graphics projected onto the scrim can appear to float in midair. Other parts of the beam go through the holes in the scrim and continue forward. 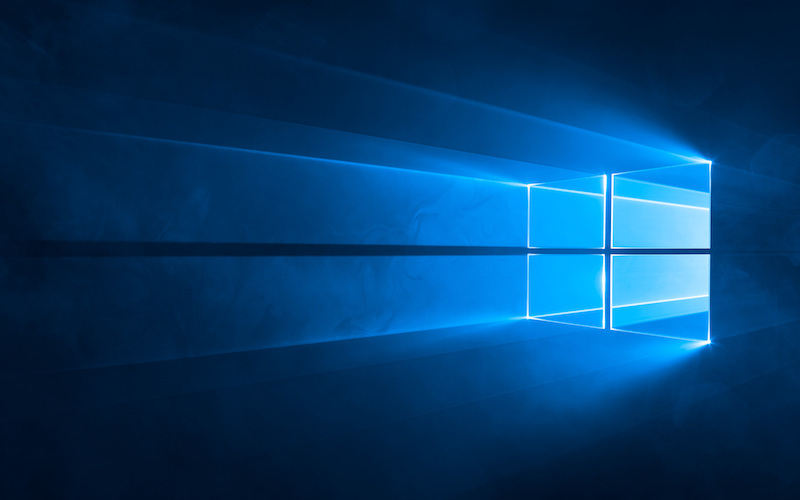 The well-known Windows 10 logo, created by a team of artists including ILDA Member Adam LaBay, features beams going through an acrylic window. The laser illuminates edges that correspond to the Windows logo, while the beams also keep going. The beams are visible thanks to theatrical fog put into the air. The laser software used to create the beam patterns was Beyond, made by ILDA Member Pangolin Laser Systems. The laser projector used was a ClubMax 6000 from ILDA Member Kvant. A behind-the-scenes video showing how the logo was made is here; the laser portion begins at about 1:26. 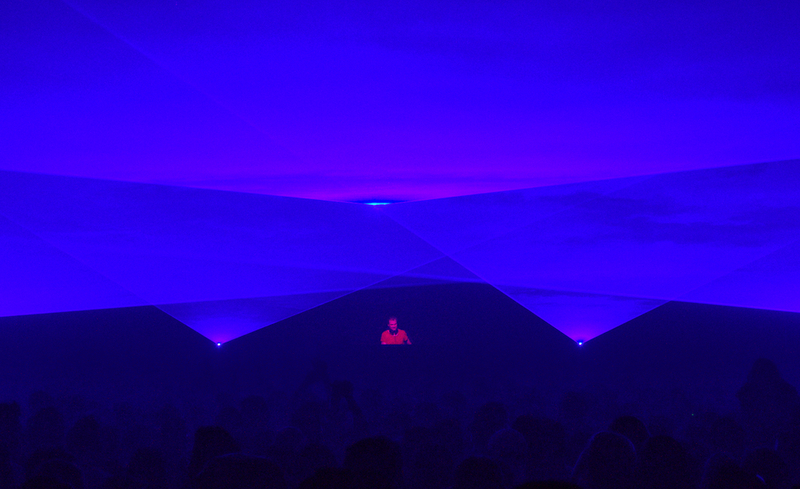 A “music video” featuring only the lasers is here. Haze machines put a very fine mist into the air, often unnoticeable to audiences. Yet this can be enough to make laser beams sufficiently visible. Generally, the haze spreads evenly so that effects such as a cone or plane of laser light look smooth. Hazers are less likely to trigger ionization-type smoke detectors. With enough haze, they can trigger photoelectric (optical) detectors that look at the air visibility. Fog machines put out a thicker, more visible “smoke”. The fog may billow; thicker and thinner in places. Effects such as a cone or plane of laser light will have swirling areas since the thin beam illuminates just a cross-section of the fog. Both types — haze and fog — have artistic merit. It is up to the show designer which one gives the effect he or she is looking for. Fog is more likely to trigger ionization-type smoke detectors. And even a little fog, if it wafts up to a photoelectric detector, can block the light and set off the alarm. In one sense, fog from a fog machine is smoke — it is caused by heating. Actual smoke from a fire is not usually used, except for very small-scale displays in a home or small room (e.g., blowing smoke from a cigarette or incense). Fog can be blown over ice, or dry ice or liquid nitrogen can be used to create floor-hugging fog, such as in a haunted house. Since most laser shows have beams overhead, this is not usually used. However, if the cold fog is pumped through a pipe with holes that is overhead, this can create a fog curtain, onto which laser beams and/or graphics can be projected.